I am awaiting the new launch of the Pawtrack latest collar. It looks good and due out mid May, but that has been delayed since January. £125, with free first year subscription , £45 annual after that, slightly more if monthly. We are also eagerly awaiting the release of that tracker, it sounds very promising! Great insight here! I’m open to more tracking devices from those who could recommend. GPS 3G signal specific. Thanks! This is for my free-spirited cat’s own good. Thanks for your message Abby, which devices have you used in the past? I wonder if anyone has thought of kinetic charging in the devices to cut down on size but retain a good battery time? I tried the Pawtrack and it’s potentially absolutely great. When it was working it tracked my cat extremely well. The problem was that it wouldn’t stay on him, and that led to other problems and eventually to me losing my money. The first time it came off I found it again with very little trouble by activating its bleep. I was worried though because he’d barely been wearing it three days. I put it back on him and it barely lasted two days after that, and that’s when the real trouble started. He lost it just before midnight on a very wet night and because of the weather and other problems I wasn’t able to get out and look for it immediately. By morning, when I’d expected to get a good fix on it and activate the bleeper it had malfunctioned due to water getting into it. I eventually found it in a neighbour’s back garden but it was dead as a dodo. Pawtrack replaced it, and said they’d improved the fastening to address the problem – it was obvious I wasn’t the only one experiencing this. However, within a day he’d lost it again, this time by the side of a road, and by the time I found it, it had been run over by a car and smashed. Pawtrack refused to accept liability and I lost about £150. The incident with the car was pure bad luck, but the collar was coming off far too often. My cat has never lost his ordinary collar, not even during the two months when he was lost and living wild in the hills (the reason for wanting a tracker collar). The combination of the thing repeatedly coming off and its not being waterproof is lethal. It’s not possible to ensure that it doesn’t come off and lie in the rain overnight, but if that happens it’s dead. I tried the GPcats thing, but it wasn’t tracking accurately in my area, which is odd because the Pawtrack was. But the manufacturer said the collar was working OK when I sent it back, so they refunded me the money. I would try the Pawtrax Halo, but they say it’s not recommended for cats with necks less than 22 cm in circumference and that’s quite big – bigger than my boy. They also have a draconian no-refunds policy which includes saying they won’t accept a return made because the collar can’t get a signal in your location. I can’t afford to lose another chunk of money like this. I had another scare today when my cat didn’t come in in the morning and I had to leave for an all-day appointment. He did come back, but I was worried sick all day. I need something that would at least locate him if he vanishes again but I simply don’t know what to buy. I really wish the Pawtrack was a bit smaller and lighter AND ACTUALLY STAYED ON THE DAMN CAT (and was waterproof enough to survive a wet night out) because it was brilliant when it was on him. thanks for sharing your story, some cats seem to have uncanny knacks for losing them perhaps by wriggling through unseemingly tight spaces all the time, who knows!? The trouble is cats that are good at escaping from their collar will escape regardless of what tracker or collar type you use. I wonder if it would be worth considering getting a chest harness for your cat and securing the tracker to that? Do let us know what you decide on! I think the problem I had is a specific fault in the Pawtrack. It has an unusual velcro fastening and I noticed a lot of people on their own forum complaining about the collars coming off. The fact that they modified the fastening suggests they were aware of the problem but I don’t think the modification has helped. It wouldn’t be so bad if the damn thing was waterproof. However, rain happens, and if a collar has a tendency to come off it’s only a matter of time before it ends up lying in the rain for long enough to be drowned. That’s the main reason I wouldn’t go for another Pawtrack. Jori isn’t a habitual collar-loser. He has never lost his ordinary collar in a year of wearing it. When he got lost and was living wild in the hills for two months he still didn’t lose it, and indeed it was that collar being noticed by someone who had seen the lost cat posters that eventually reunited us. I really don’t want to send him out on the prowl in a harness, the idea makes me quite nervous. I also think the Pod is too bulky and will swing like a pendant from his neck which I don’t think is satisfactory. I want something that’s either built into an integral collar or that’s small enough to clip on to his collar without dangling like a pendant. Based on your reviews I was wondering about the Trax. I don’t mind charging it every evening – I was doing that with the Pawtrack anyway – so long as it does last a couple of days. What do you think? To be honest, I’m still shaking, after having spent today imagining he’d vanished again. I’m being ridiculously paranoid, but after having spent two months searching for him, then him coming in injured a couple of months after I got him back, I just can’t help worrying. Hi I have a neutered Tom aged 13 years old. Despite this he is a wanderer and can be gone 24 hours or more causing no end of worry! He is quite a small Tom as well and often comes back having been in some kind of scrap and having lost his collar. I’d love to know where he goes and would like an efficient small tracker also cost is important. I’ve read all the reviews and still can’t make my mind up. Hi Andrea, thanks for stopping by, I would recommend either the Weenect based on it’s value for money or the Trax based on it being nice and small. Do come back and let me know which one you decide on in the end, thanks. Hi Dan, and thanks for the reviews. This is a minefield for us, as we live in a very rural area with barely-2G coverage plus trees and bushes galore. Our large garden is supposedly cat-proof-fenced, but we have a youngster who sometimes gets through to the road, so we really could do with a device that tells us exactly where he’s been (RF is not sufficient, as it would be a random chance that we’d track him on one of his escape bids). Would the multi-technology Pod3 cover the gaps in coverage, do you think? Just another aside re. G-Paws: I bought one a while back and it would never so much as switch on. Very poor quality and absent customer service too. I agree with you here the Pod 3 has GPS, Wi-Fi, Bluetooth and mobile tracking capability so if coverage is a problem it’s a great option as you have a lot of different ways of keeping track of him. GPS often works well for people in rural areas with low mobile coverage, so i would definitely go for the Pod 3, it’s the market leader for a good reason! Also you can use this link to get 5% OFF all Pod products Storewide. Hi again Dan. Well, after all I said there, and a lot of research, we went for the Tabcat after all. It came down to the potential (in)precision of any of the other devices, which we decided might cause more concern rather than less. It’s true that we are still going out every hour or so to check on our youngster, but the great thing is, if Tabcat tells us he’s in the other direction, we can come straight back in! I must say, it’s also great fun – for us and the cats. They seem to like the bleeping, and associated it very quickly with us. As some other users have said, it’s also turned out to be an alternative way of calling them – without the hoarseness or annoyance to neighbours that the conventional method entails! My husband was sceptical at first, but he’s a complete convert. Many thanks for your input in any case – much appreciated. Hi Amber, thanks for coming back and letting me know how you got on, I do love the tabcat, so long as you aren’t worried about being able to track their data on your phone it is a brilliant little tracker which is very reliable and gets the job done well! Hello, I have a deaf cat that I let out into our garden which is huge but she wanders off and can’t hear me calling her. Which device would be best for her, she is a smallish Persian female. I just need to know where she is and to locate her rather than where she has been. I would recommend the Tabcat, it’s a fairly simple Radio frequency tracker which doesn’t use a mobile app or anything to record where they have been. It directs you to your cat using lights and a series of beeps which get quicker the closer you get to your cat. It’s a reliable tracker which I’m sure you will be happy with, do let me know which one you go for and how you and your cat get on with it. Hi Dan, thank you for your reply but I feel with such a large area to look and find her, the beeping system could have me walking all over the place lol, I need something small and maybe if she is hiding and not moving ( she has a collar with lots of bells on) the maybe something that can beep? I don’t mind paying a subscription but because she is petite the device needs to be small. Thank you ? Hey dan, looking at the pod3 and weenect in isolation, which would you recommend and why? Whatever I buy I am going to need 2. They also need to be part of or attached to a safetycollar as I get through about 10 lost collars a year. One of my cats stays close to home (I think) the other one roames well over 100m so the radio frequency devices are out. I live on a housing estate with some woodland attached and am interested in knowing the history of where they go, but not nessesarily the fencing with notifications as I spend most of my working day away from a mobile so a web based option would also be useful. Hi Emily, thanks for paying us a visit. I would recommend the Pod 3 as they are one of the few trackers that allow you to view their data through a web based browser. They can easily be attached to a safety harness and tick all the boxes you have mentioned plus loads more. Do let me know which one you go for and come back and let me know how you got on with it, thanks! Hi, our cat is a house cat (on recommendation from vet) and we only really want a tracker to help us find her if she ever decides to run past us when a door is open and go for an explore. We’re not that interested in where she has been or how active she is, we only really want to know her specific location if she does get out. Reading the reviews we prefer the idea of one of the trackers with an app that can show us exactly where she is, instead of following a beep that might lose track if she roams too far from us, but there doesn’t seem to be something that just gives us the basic location, they all seem to have a load of additional functions that we don’t really need. What would you advise? I see you responded to Jess B’s comment mentioning the Novita Kippy Vita but that link seems broken, so I wasn’t sure if there was now something better out there. The Novita Kippy Vita could well be a good solution for you guys, sorry about the broken link I have fixed that now! Thanks. That’s my number one concern with all the other products…. just can’t see MY cat wearing anything the size of the pod3 even though they show pics of cats on their Site. Yes that is the one issue with it, it is fairly bulky. The Weenect is a good alternative which is often overlooked because of it’s low price. The Tabcat is also very good too if you don’t need all the digital data tracking. most of these trackers should function fine in both the U.A.E and the U.K. Personally I would recommend either the Pod 3 or the Tractive. Let me know how you get on with the pawtrack, I’ll definitely get it added on here at some point! Hi there. I ran across another product called PawTrack. It’s different in that it’s an actual sleek flat collar tracking device designed just for cats. Do you have any experience/thoughts about that product? Hi Kat, I have come across the PawTrack too, I haven’t yet reviewed them but we mad add them on here in the future. They look like a very good collar tracker that tick all the boxes as far as I can see. I’d probably still go for a Pod3 given the choice but the PawTrack looks like a high quality alternative and I like that it’s built into a collar rather than being a bulky attachment. I lost the will to live with the Pod3, which is sad as I was a massive fan of my Pod2, so upgraded using the 30%. Bought the Pod3 in May17 with the XLBattery, and finally I received it Dec17 (without battery as they were stillnot available), and it was awful, with GPS not connecting, battery dead in 20hrs (should last 4days). Pod said I had been sent US stock along with many other patiently waiting customers and they’d swap it out in January. March18 I was still waiting for a Pod to get me my May17 order sorted, still getting excuse after excuse, constant delays and failed promises. I gave up and demanded full refund which I got. Now on the lookout for alternative, possibly the new Pawtrack collar with delayed launch May18. So sorry to hear of your bad experience with the POD3, I know many people have had good experiences with it. Do you live in an area with poor reception at all? I think you might have the size wrong of the Novita Kippy no.3. No way is it 600mm x 300mm x 200mm. Oops thanks for pointing that typo out. That would make it bigger than almost all cats! I’ll get it fixed! Thanks for letting us know about that one Gillian, that is the last thing you want from a tracker! I will update the article shortly…or possibly remove it from the list. Under pros for the pod 2 it states 50% discount on future models for all existing users. I have a pod 2 that has recently broken, how do I go about getting 50% off the pod 3? I’ve just checked and the discount is now 30% (apologies – I’ll update the article!). To claim it you just need to login to your pod app and then click on your pet picture and then the pod picture to get your Pod ID. Send this to the guys at Pod either by email or through their live chat for a quick response and they will send you a discount coupon back which can be used in the site shop. Hope that helps! Hi, I’m not bothered about where my at has been but more where he is when he hasn’t been home for a few days, eg shut in a shed or on someone else’s lap – I think he has found himself a holiday home 🙁 . I’m lousy at changing batteries and don’t really do techy stuff, could you point me in the right direction please? We live in a rural location but said cat would be somewhere in the village I suspect as he’s turning into a porker! Many thanks. Thanks for stopping by, I would recommend the Novita Kippy Vita. 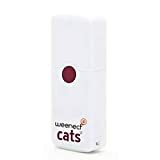 It has an app which will show you exactly where your cat is and the battery lasts up to 20 days, probably the best battery life of any of the trackers which use mobile apps. Which RF tracker did you go with? Your title says GPS trackers yet you include RF ones? This is true, I intended for it to be just about GPS trackers but there are a few great RF alternatives out there that I ended up putting in too, maybe I should amend the title! Do you use a cat tracker HMD? I’ve been using the Pod2 for a couple of years and it’s great! Would highly recommend! I’ve tried it too, the one thing that could be improved is the battery life, though this is the same with all the smart trackers, so definitely rate it as the best of the mobile app trackers. Have you tried using anything else? I’m a Pod 2 user, but would like to try something smaller. I guess the size really has to do with the functionality. This write up makes that pretty clear. For now I’ll stick with the Pod 2! Yes Pod 2 is very much the market leader at the moment, the Pod 3 is coming soon though so watch this space! Do you think you’ll buy it?